This is the first in a series about what you can do to make a difference in a world that’s going to hell in a hand basket. Last weekend, when I was on the Animal Wise radio talk show, Mike and Beth (the hosts) asked me how any of us can stay sane in a world that’s going to hell in a hand basket, what with all the abuse of animals, destruction of the oceans and forests, climate change, etc. – especially if, like me, you keep up with all of what’s in the news every day. I suggested three things: Pick up starfish ... stick to a plant-based diet ... and keep in touch with other people of like mind. We didn’t have time to go into these in detail, so I thought I’d say a bit more here about each of them. Earlier today, I posted a story about the criminal conviction of a man who has made millions of dollars abusing Tennessee Walking Horses ... which reminded me of the fact that an old friend, Tom, had recently rescued a similar kind of walking horse from a life of similar abuse. 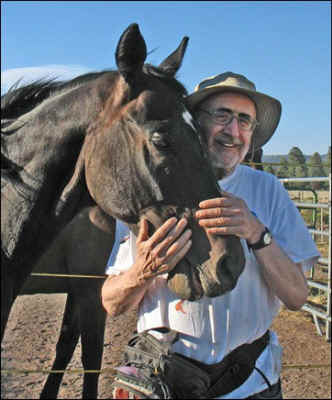 When I was driving through Flagstaff, Arizona, a few months ago, I stopped to visit Tom, a professor of music who used to teach at Northern Arizona University and conducted the local symphony orchestra. In the early 1990s, he used to come up to Best Friends Animal Sanctuary for a few days with his Basset dog, Bubbles, and a tent. The two of them would camp out at Dogtown so that Tom could wake up each morning to his favorite music: the chorus of hundreds of dogs greeting each other at sunrise. And then he’d get busy with his favorite activity – what he called The Zen of Poop Scooping. Tom has built local spay/neuter, shelter, adoption and dog training programs. And back in the Internet Stone Age, Tom and I started one of the first online forums for homeless pets on CompuServe. But these days he devotes his life to “picking up starfish” – like being part of a network of people who drive dogs to the next stop along the route from a shelter to their new home often hundreds of miles away. 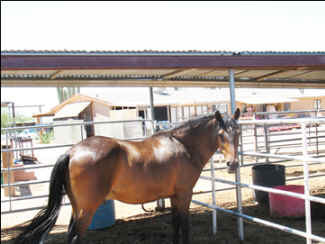 A few weeks ago I acquired a Peruvian Paso from a horse rescue in Apache Junction. Don’t ask me why I did it. I just knew they needed someone to take him so they could rescue more horses from the meat wagon in Mexico. I have named him Spartacus. This poor guy, who is probably around 18, has had a horrible life. Abused with ill-fitting saddles and ridden very hard at gaits that were injurious to his back, I didn't think he'd ever be sound enough to ride, and that wasn't my original intention. All I wanted to do was see that he had a better life than formerly for as long as I could manage it. As JFK said, "Ask not what your horse can do for you; ask what you can do for your horse." Spartacus is sweet, high strung and terrified of oh so many things, including–at the beginning–me. But things are changing. He's seen a vet, two trainers (plus me), a farrier, a chiropractor and soon a dentist. You’ll be overjoyed to hear that he has good hooves and minimal worms. I spend six to eight hours a day out at the ranch where I board him. I take him on long walks in the hills to strengthen his back, work on basic training exercises, work him in the round pen, and so on. I study horse nutrition and prepare a special diet for him daily. I clean up his paddock and often the one next door because the good woman who boards them is swamped too. In my spare time I try to keep the old truck and trailer I bought running so I can get him to the trail, and study, study, study. I have so much to learn so fast if I am to help him. And I am a total novice as a horse owner, caregiver and rider. Surprise: the chiropractor proclaimed him fit to ride! That will mean mainly walking and exercising for a while. He is a gaited horse but he doesn't seem to know the gaits for which he was bred. We both have such a long way to go. I have ordered a saddle for him which I pray will be comfortable for him and allow him to enjoy life with humans again – if he ever did. Anyway, that is what I'm doing, day and night. The good part for me is I never have a minute to think about myself. I am walking, running (literally), moving hundred pound bales of hay, trying to tell in advance when Spartacus is going to drag me down a hill or kick me – it's an entirely new life and a very thrilling one for me. Tom knows full well that things are not right with the world these days ... and that they’re going to be getting worse. But he’s no longer interested in trying to set the world aright. For him, right now, it’s all about Spartacus. And looking after Spartacus, which involves everything from cleaning stables to carrying hay to “study, study, study,” is what keeps him sane in a world that he knows is no longer sane. We may not all be quite as obsessional as Tom, but whatever else we do, we can all pick up starfish. Maybe that means volunteering at the local shelter once a week or once a month, fostering a homeless pet, being part of a local wildlife program that’s counting birds or butterflies, or helping clean up a local stream. Most of are not up for trying to save the whole world (and that may be something of an arrogance anyway), but we can all save the world of a dog or a dolphin, or the world of the birds and butterflies in our neighborhood. And we can all use less water or less gas. Or maybe plant some flowers for the bees or some vegetables for ourselves. It will make a big difference for them. And to whatever extent you're saving the world of a starfish or a Spartacus, it always turns out that they’ll be saving your own world at the same time. And that’s probably the most meaningful kind of relationship we can have with the world of nature – and with our own true nature. This is the first in a series about what you can do to make a difference in a world that’s going to hell in a hand basket. Second in the series is Food, Life and Liberation.